Earth Hour has been held annually since 2007, when it began in Sydney. The following year other cities, including Christchurch joined in, to help raise awareness about the need to take action on climate change. Earth Hour 2010 will take place on the 27th March from 8:30pm - 9:30pm, wherever you are in the world. Participants are asked to switch of their lights, and other non-essential appliances for one hour. 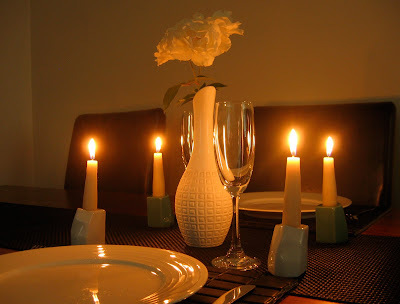 One way to join in is to have a candle-lit dinner. These hand-tipped tapers made from recycled convent candles are great for the dinner table. They don't smoke or drip, are fragrance free, and fit into most standard candle holders and candlebras. I have used some modern ceramic holders from nood. They would also look stunning in an antique candle holder. 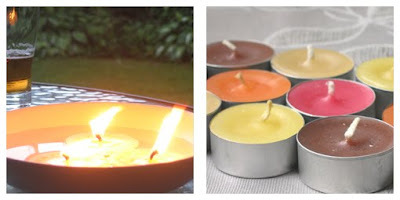 My range of recycled wax candles also includes floating citronella candles, and recycled tealights. I am also working on a range of soy container candles, but unfortunately I can't guarantee they will be ready by Saturday. Thanks for all the encouragement received in response to my last post. It's lovely to see how supportive the crafting community is. I'm slowly getting myself sorted into the swing of things, you should start to see some new products soon.